As part of a two year trial, electric autonomous buses hit the roads of Switzerland with a pair of driverless moves. In this two year trail run electric buses will be tested for how well they are operated in the real-time traffic. These fully electric buses are capable of carrying 11 passengers at a time. And this bus now operates only in the city of Sion – the largest city of the Canton of Valais. Self-driving cars are gaining popularity in the field of transportation round the globe right now. So, this project is to improve the Driverless vehicle technology behind just autonomous cars. 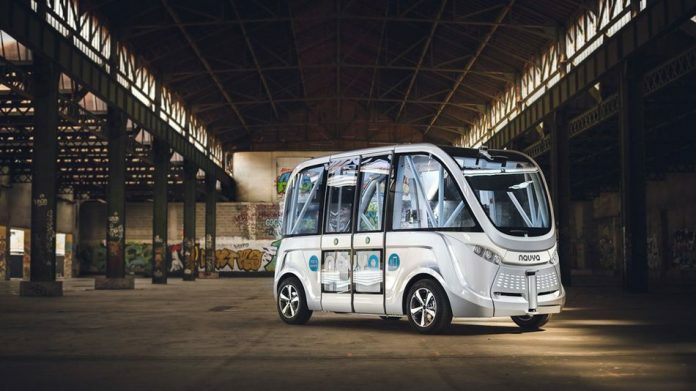 Currently, we have other autonomous buses being tested across the world which include the EZ10 in California and Singapore, the Navia also in Singapore, and the IBM-powered Olli in Washington DC. These advanced self- driving vehicles are even capable of talking to its passengers on the way. PostBus, Switzerland’s leading public bus operator will operate these autonomous buses. And software developed by a startup company, BestMile is used in these buses to navigate the Sion city streets. Passengers will ride these buses for free of charge. The buses are packed with air conditioning, a backup battery and an access ramp for physically challenged passengers. The two autonomous vehicles will travel along the edge of the Sion city which has 33,000 residents and pass through pedestrian areas. The top speed of the vehicle is limited to 20 km per hour (12.4 mph). During each shuttle, a trained attendant will be available on board. In case of any emergency situation the human attendant will has two failsafe options to control the bus. EPFL’s Urban Transport Systems Laboratory researchers are collaborating with the aim of constructing a system that manages of moves of the autonomous vehicles. The smart fleet of the self-driving buses comes with a flexible timetable which will include few fixed stops. Passengers will be able to ride only from Tuesday to Sunday. An app is used to check whether the bus is available or not. All other specific needs of the passengers such as on-demand services, booking a ride in advance and offering flexible routes will be included in the reliable system. The algorithms of the technology will enable these tasks in the real time, which include buses communicating with one another and other vehicles on road, without abandoning the safety or cost efficiency.